Hiya! 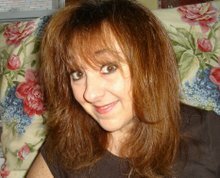 I'm BACK and I'm multi-tasking tonite; I'm washing clothes & trying to upload & edit CHA photos! 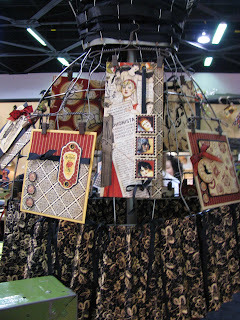 I spent most of my time working at the Crafty Secrets booth, so I don't have the MOTHERLOAD of photos this year, but trust me, I did get to sneak away and will have plenty to show you in the next few days! 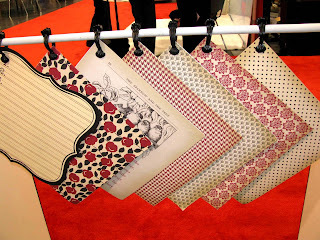 I tried to pop in to all of my favorite booths, and will show you the select highlights of what WOWED me this year! 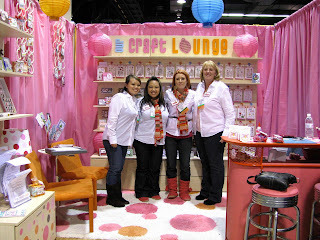 Here are the talented girlies from Our Craft Lounge, in their first-EVER CHA booth! 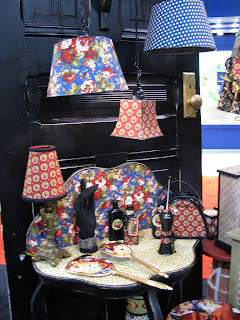 I had no idea what to expect when I heard they were having a booth; but they BLEW me away with the cuteness of it all! 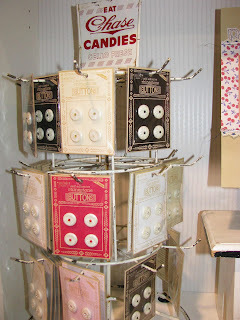 The booth looked bright & LOUNGY, with retro bar-stools and a cute pink & orange bar to sit at while you did make & takes! 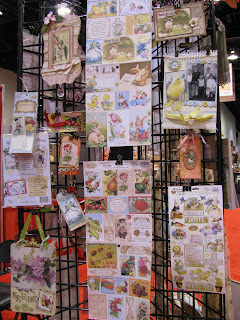 OCL is releasing over 20 brand spanking new stamp sets that will be hitting the stores mid-February, and I have samples to show you as well, since I helped do trade show samples for the booth! 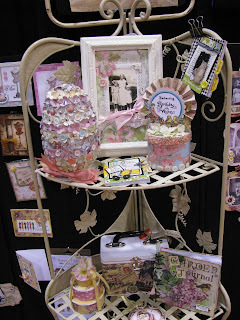 The OCL girls have a brand new product out, called "Sparklefluff", that is a mixture of glitter & flock! They had it in a big martini glass and it looked like fluffy ice cream (with no calories, of course)! They also have some cool new colors of flock. 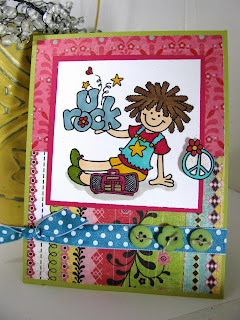 Here's a sneak peek of a new set that will be in the next release, called "Star Rocks"! 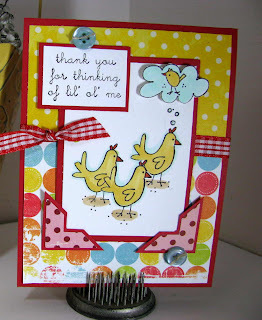 This little boinky-curled chickie's name is Star, and she 'STARS' in at least 2 new sets! She's friends with Anna Mae and the other girlies from last release! Star comes with lots of fun little accessories that you can mask off and put in her hands, like a guitar, a lava lamp and a stereo! I don't think you can see it in this photo, but I used hot pink & orange flock to make her outfit fuzzy. 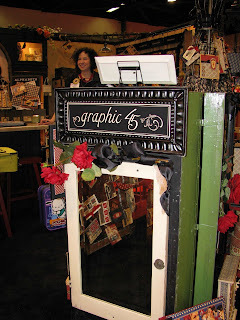 So I'm off to edit more photos; I have Graphix 44, Websters Pages, Doodlebug & Clip-it-Up booth photos to post soon! One last post & I'm off and running. 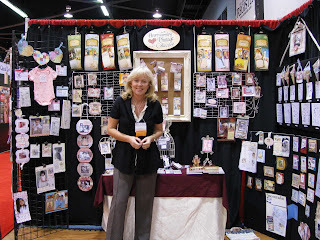 I have my Barbie suitcase packed & my samples in a bag and I'm off to the Anaheim Craft & Hobby show to work in the Crafty Secrets booth! 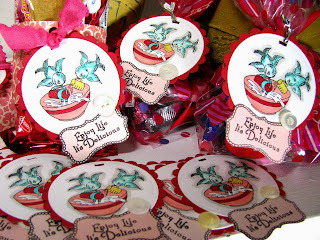 I couldn't resist doing one last project before I leave for the show; I whipped together these treat bags to give out at the show to friends. 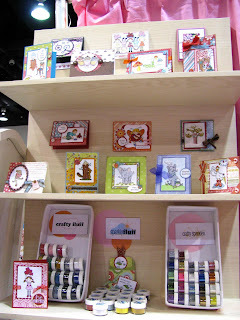 I'll be making stops at the "Our Craft Lounge" booth, Hanna Stamps, Crafty Secrets and a few others with treats in tow! 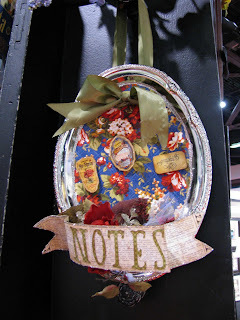 Since money is tight this year with the economy, I was on a mission to make these as inexpensive as possible, yet still have that cute factor to them. So I headed to my grocery store for Little Debbie cosmic brownies, Nilla cakesters (strawberry flavor), Hersheys cherry kisses, and of course, CHOCOLATE. 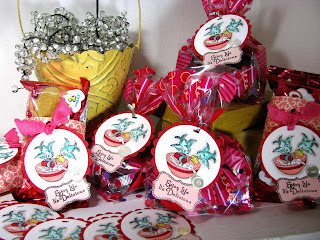 The little heart cello bags are from the Target dollar spot; 20 bags for $1.00! SUCH A DEAL! 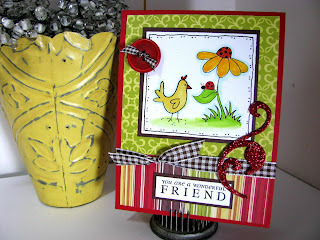 The tags were made with the new Crafty Secrets" Sweet Stuff stamp set; I can't get enough of these Cinderella Birdies! 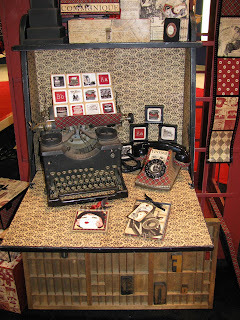 I'll be back on Wednesday with more sneak peeks of the new release Our Craft Lounge sets, and hopefully lots of CHA photos if I can sneak away from the booth to check out the new goodies! Have a great weekend, everyone! Moving on to day 3 of 'ANNA WIGHT' week with another little scene from Whippersnapper's new Anna release called 'Fish Friends". 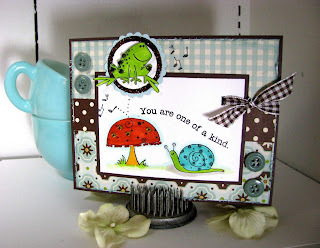 I know this little mushroom was meant to hold this sweet little froggie in a sitting position. But I wanted to convey a bouncy, happy frog singing his own little tune. So I borrowed a technique I saw on a card done by Terry at Creative Cuts & More, and drew a little 'bounce' check mark underneath the frog, so that it looks like he's hopping. 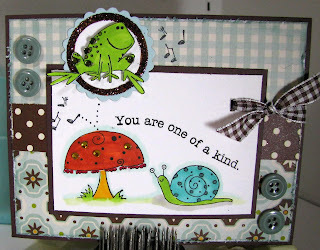 For the sentiment, I used the "one of a kind" sentiment from Anna's new "Friendly Expressions" set. At first, I thought it would be fun to color the frog a different color other than green, but decided instead to make him 'different' from the usual frogs by BLINGING HIM OUT in green Mark Richards rhinestones! Sparkly WARTs? Heck yeah! Why not? A frog's gotta have their day to shine too! 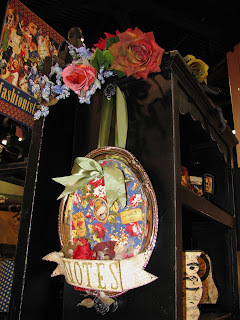 I also bling'd out the mushroom with some yellow rhinestones, and the circle around the frog with brown glitter. 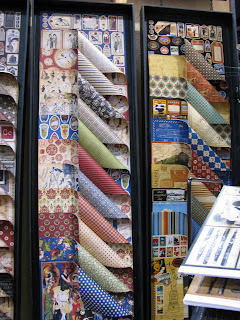 Copics: Sanguine, Celedon green, olive green, spring dim green, golden yellow, blue green, mint green and w2 warm grey. AAACK! 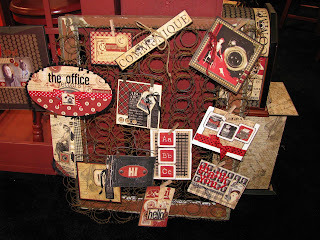 It's BLOG GONE WILD day today! 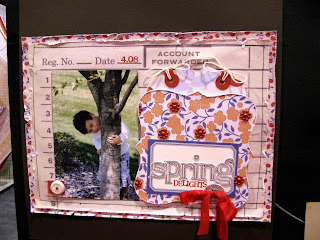 I had queued up a blog post for today with a Crafty Secrets set and forgot that I set it up! 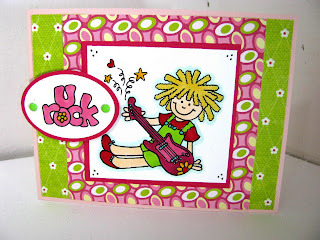 So it's a double post day today, so I can show you another Whippersnapper new release card as promised! 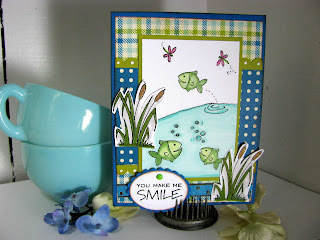 The fishies in Anna's new set are PERFECT size to create little lake scenes. 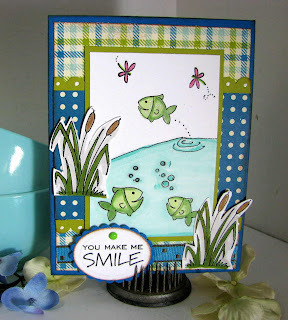 In this card I drew in a line with my Copic Multiliner to create a little 'lake' for the fishies to swim in. They are swimming in Copic Cool Shadow blue water! I also drew in the little wave lines so that it looks like one little crazy fish is jumping out of the water trying to fly with the dragonflies! 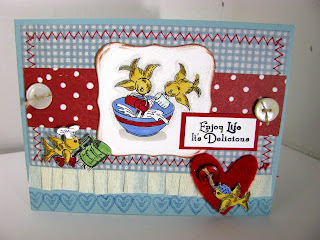 I stamped and cut out cattails and attached them to the side of the main image; I also used brown fun flock on the cattail part so that they're fuzzy! 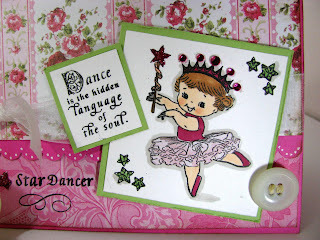 Sandy from Crafty Secrets created a small set around this cute little dancer ballerina girlie! This set has been released now, and is called "Little Dancer". She comes with lots of little accessories and the tutu is separate, so you can make our girl here into a skater, a gymnast, or a ballerina! 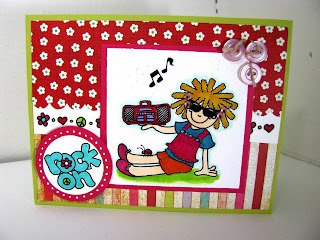 She's from the same artist as the "Birthday Kids" set, so if you're into the birthday kids & have little dancers in your family, you're gonna WANT this set too! When I dug into this set I *had* to put the crown and tutu on her right away so I could bling the crown up with pink jewels. I paper-pieced the tutu; you can use any patterned paper to create her skirt! 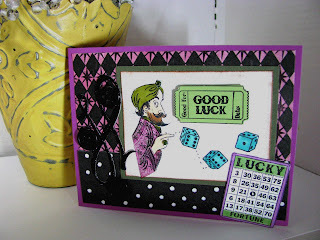 I combined 2 sets for this card, to show you other things that can be done with the Crafty Secrets "Lucky Wishes" bingo card/fortune teller set! The crystal ball can be turned into a SNOW GLOBE! 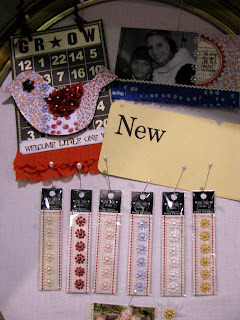 The little sledding birdies from Crafty's Snowbunnies set fit PERFECTLY inside! 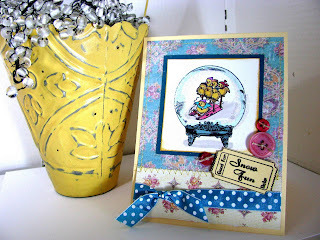 This one is not a shaker card, but wouldn't it be fun to put snowy glitter inside the globe so the birdies have glitter to sled on? 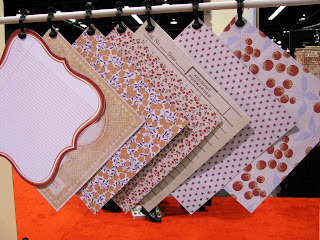 Make sure to check the Crafty Secrets blog for more sneak peeks, details and release dates! 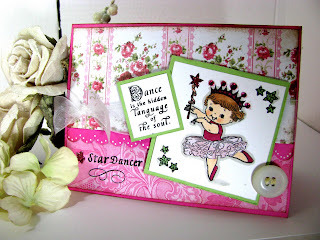 Another sample made with the new Crafty Secrets "Fairyland" stamp set (CHA new release)! 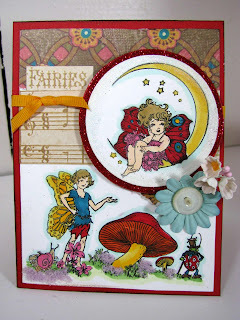 I wanted to create a little border scene at the bottom of my card, so I stamped a bunch of the cute images from this set into a woodland scene, and then added the moon fairy at the top of the card in a circle nestabilities circle. 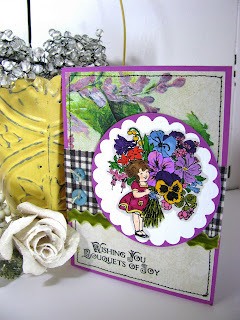 I used "Lilac" Flowersoft to simulate mossy flowers in my scene. 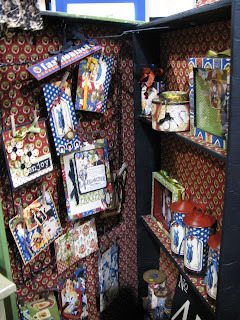 I glittered the red mat so that the border around the fairy is sparkly, and then added some Kaiser paper flowers and some vintage millinery flowers that were gifted to me by friend Pam Hooten. 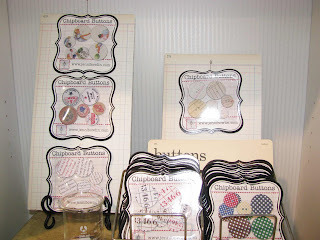 I'm putting the blog on autopilot this week; so more short posts to follow while I'm cranking out samples! AAAAAACK it's CRUNCH TIME! 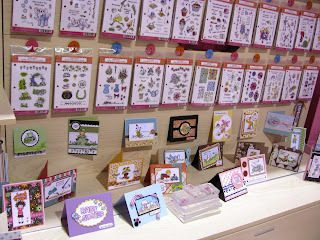 Still here in sampleland and I'm a bit behind on the blogging, so bear with me as my life is a whirlwind of stamps, paper, and soon, the dreaded PACKING for CHA! 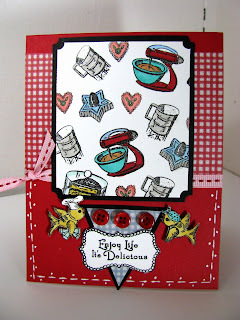 Here's another card done with the new Sweet Stuff Crafty Secrets set. These birds have to be my most FAVORITE image from this set! The remind me a bit of the birdies from Cinderella that start whipping stuff up in the kitchen! 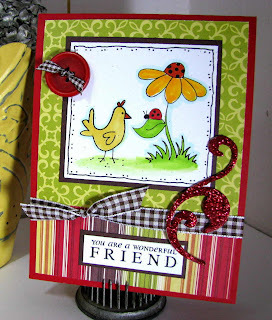 Here I went simple with the background paper so that the birdies would pop off the paper, and added a little ruffle to the bottom with vintage crepe paper. One more thing, the new dirty girls have been announced and this month's Splitcoast Dirty Dozen gallery is now UP AND RUNNING! Congratulations to Carolyn King (Cammie) and Becca Feeken, the 2 brand new, enormously talented dirty girls! 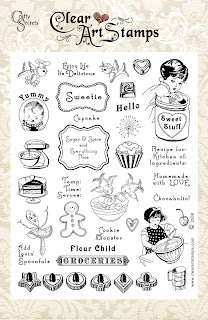 Moving on to give you another sneak peak of a new Crafty Secrets large stamp set that will be coming out at CHA at the end of the month! 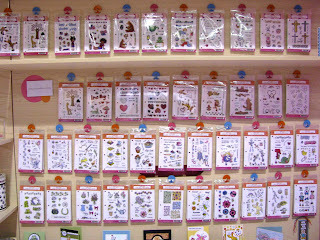 This one is called "Fairyland" and has SO many fun images to color in! 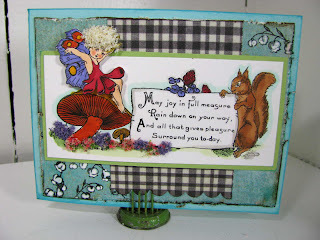 The fairy and mushroom stamps are separate, and the squirrel here holds the sentiment in his little paws! I cannot wait to show you the entire set! I went a little nuts with my Flowersoft again; this time I decided that my ivory-colored flowersoft could double as fairy HAIR! It's soft and fluffy and looks like little curls! 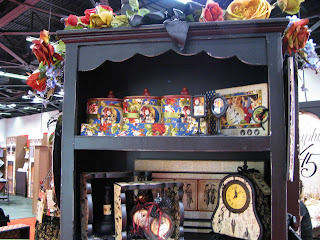 I also used it around the edges of the mushrooms for flowers. I colored in the little lilys of the valley around the image with my white Ranger Inkssentials pen so that they're white. 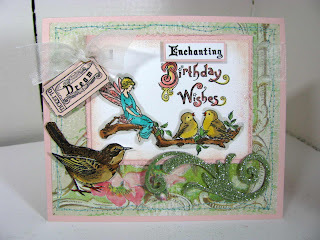 Here's another card from Crafty Secret's soon-t0-be-released "Lucky Wishes" stamp set. 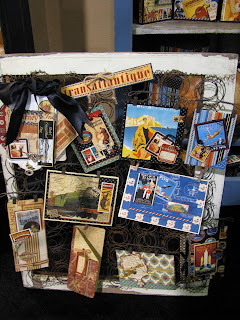 These images are from the same set as the bingo card I posted yesterday! 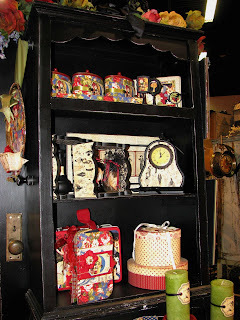 The images in this set are so much FUN...check out the funny little fortune teller guy! His coat can be paper pieced or colored in. I made a shaker card by cutting the crystal ball out with an exacto knife, and then covering it with a transparency sheet. 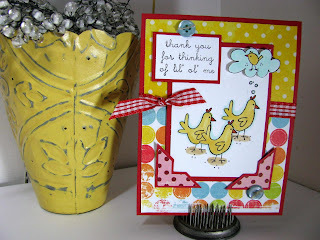 You can see a tutorial on shaker cards at Splitcoaststampers HERE. 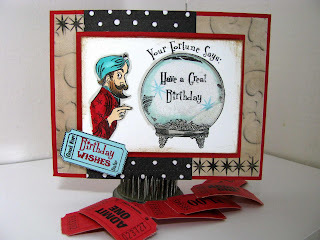 Inside the shaker card is white glitter, and I outlined the crystal ball with copic marker "cool shadow" color. The fortune teller's turban is colored in with Mint Green copic, and then I used Mark Richards Crystal stickers for his ring and the center of the turban!